Affordable Costa Del Sol Home! Walk to the beach! Ideal full-time residence or weekend home for family and friends. The home is a beautiful 4 bedroom, each room is decorated with taste and has that beach/island vibe. Has 3 bathrooms, each is huge and beautiful. The kitchen is modern and updated. The beautiful landscaping takes you straight to paradise. Plus, a big garage for all of your toys. The home is spacious. 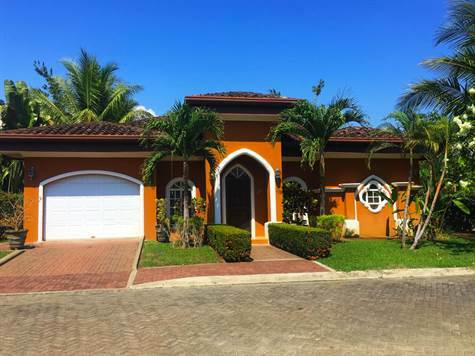 If you’re looking for a clean, safe, updated, spacious place for the best price, that’s close to everything fun to do in Costa Rica and that has all the amenities with the best beach, this is it! This is a resort quality home. Everything in this home has been thought of to make it a true home away from home experience, with Costa Rica’s beauty and your own private pool! You won’t have to worry about security here, so you can relax and Pura Vida your vacation! Amenities include swimming pools, large rancho BBQ/Party area, tennis court, underground utilities, and low HOA fees. Great safe location and a short walk to the beach.